You can’t visit Vermont without seeing some cows! 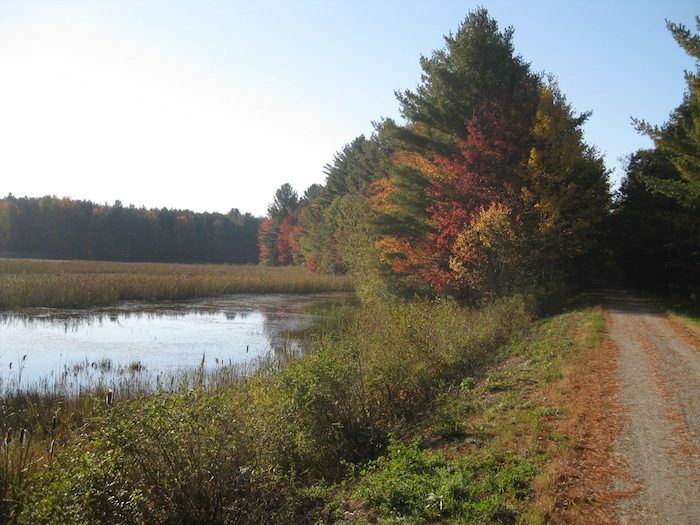 This rail trail starts in St. Albans, winding northeast to Richford, providing direct access to old Vermont Dairy country. The North Branch loop has both paved and unpaved surfaces, and is fairly flat. The route passes through Richford’s village center, over some moderate hills, and follows along the river. The gentle terrain makes running a breeze while enjoying postcard images of rural farms, leaf-strewn woods, and rolling fields. Paralleling the Missisquoi River, the entire trail spans 26.1 miles from St. Albans City to Richford, passing through the towns of Swanton, Fairfield, Sheldon, Enosburg and Berkshire, including forest, farmland and several village: Sheldon Springs, Sheldon Junction, Enosburg Falls, and East Berkshire. With a crushed limestone surface, the trail never exceeds a grade of three percent. Full information on trail.